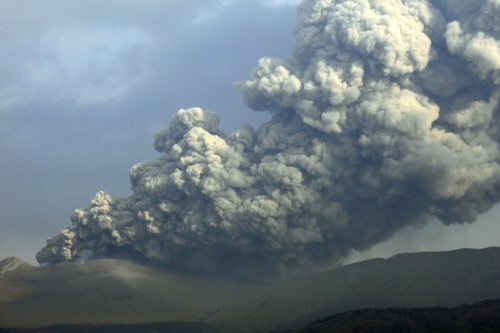 Shinmoedake’s volatile eruption is understood to have been sparked after the country’s Meteorological Agency reported there had been 100 volcanic tremors per day had been registered so far this month. The volcano, located on the southern island of Kyushu, blew its stack on Wednesday for the first time in six years. Tremors in the Kagoshima and Miyazaki regions have intensified since September prompting the agency to issue a Level 2 warning. At Level 2 residents are restricted from entering areas near Shinmoedake’s mouth, while a Level 5 urges people to evacuate. It is believed the earthquakes were caused by the movement of magma and hot water underground that caused periods of shaking that lasted for several minutes. Earlier this year the agency issued a Level 1 warning following signs of volcanic activity in May. Japan is located in the famous ring Ring of Fire, where about 75% of the world’s volcanoes are located. Incredibly, the island nation is home to 10% of active volcanoes and as many as 1,500 earthquakes are recorded every year. Closer to home, panic erupted over fears a Canary Islands volcano could blow and send a monster tsunami to hit Spain after 40 earthquakes struck in just two days.